PNC Infratech is going to list for IPO on 8th May, 2015 with Price Band of Rs.355 to Rs.378 per share. Here is financial performance review of PNC Infratech, read, analyze it and decide should we go for PNC Infratech IPO or not. PNC Infratech provides infrastructure construction service in india and is looking for money from you. They provides EPC services including BOT, DBFOT and OMT projects.They are going for proposed Rs.488 crore IPO on 8th May, 2015. Where you need to invest minimum Rs.Rs.12,425/- (minimum 35 shares). Below is more information about PNC Infratech IPO. Minimum Investment at PNC Infra :- Rs. 12425/- with 35 shares of minimum Subscription (next share 65 multiple). IDFC Securities Limited and ICICI Securities Limited are Lead Manager. Download Official Prospects of PNC Infratech. Why PNC Infratech is looking for money? PNC infratech is looking for money to fulfill working capital requirements, repayment of debts, Require money for investing in next big projects, part payment of Raebareli-Jaunpur Project and etc general purpose. In last few years, PNC Infratech has done good growth but in last fiscal year, FY 2013-14, they reported downfall with revenue Rs.1145/-. 2. Profit of Rs.67 cr in last fiscal year. 3. Last year 2014, in first 9 months, PNC Infratech posted revenue of Rs.1097 cr with profit of 66cr. 4. PNC Infratech has posted last 3 years weighted average EPS of Rs.16.06 per share and Rs.15.68 for the nine months ended 31st December, 2014. 1. PNC infra is showing 6% of growth since last 5 years, which is quite good. 2. In 2013-14 fiscal year, as mentioned above, they shown downfall, but in current fiscal year (1st nine months) seems they are back on track with good profit. 3. PNC infratech has received bonus from National Highway Authority of India (NHAI) for completing four lane road of Agra-Gwalior NH 3 road. 4. They have good experience in working in all states of india. 1. Rs.68 cr of pending Income tax, sales tax, service tax has listed on the name of PNC Infratech.Also, Rs.14 cr of pending civil proceedings on name of PNC. 2. If company fails to complete projects on time, it may lose heavy since construction business is quite tough in india now. 3. PNC infratech's 5 directors having Legal proceedings on their name, in future, found guilty, may cost heavy to company business. 4. Company has not announced any dividend for the year 2007 to 2012 (i.e 5 years). Final Decision :- Should We invest in PNC infratech or not? 1. Well, the IPO with price band of Rs.Rs.378 per share and Rs.355 per share seems costly, because, on 31st December, 2014 company has declared EPS of Rs.15.68.But with current IPO price it is 22.23 to 20.88. Which is costly. 2. Since Narendra Modi Government is quite focused on Infrastructure Projects, this comapny may gain and have good future in upcoming years. 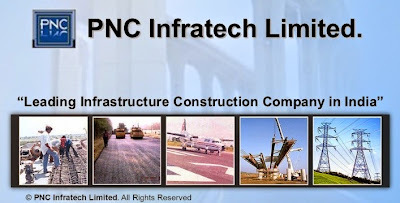 Check here the current projects of PNC Infratech. So, Retail Investors with high risk patients can invest in PNC infratech at lower band Rs.355/- only for long term. Check out Rakesh Jhunjhunwala Portfolio of 2015.